Anyway. 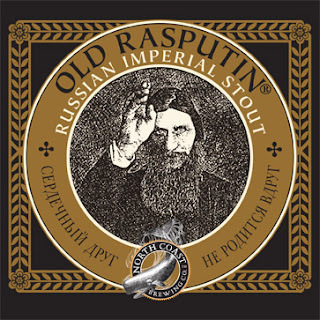 Old Rasputin Russian Imperial Stout is a great beer for dark cold nights. It pours thickly and produces that nice tan head, which hardly dissipates at all as you drink. Again, I'm not great at picking a lot of things up with the aroma. To makes it even more challenging I had this one at the tail end of a sinus infection. But...I did catch a lot of malty sweetness on the nose which is reinforced supremely when you taste it. The flavor is full bodied and complex. A lot of caramel maltiness mixed with some roasted coffee at first. On the back end is where it gets bitter which is a great reward after the sweetness and syrupyness of the malt. So the tastes really compliment each other well and balance the tasting throughout. As you swallow it all kind of comes together and leaves your mouth and lips rather sticky. I was actually a little surprised at how bitter it was and how much hop flavor there was. By the end I found myself on the North Coast site checking the stats. Old Rasputin has 75 IBUs which is pretty hoppy and probably why I enjoy it so much. It also touts a whopping 9% ABV, but I found very little if any burn from the alcohol. And that is a testament to the flavor that makes the alcohol content so well. So all in all, Old Rasputin lives up to its Imperial branding AND its cult following supremely. Great beer from the left coast that will make any occasion just a little warmer.